Can loneliness make you sick? Humans need connection. Without it we simply cannot thrive. If you often find yourself feeing lonely or isolated, read on to learn more about how feelings of loneliness and the experience of social isolation can affect your health. And for those of you who have a great social network, lots of support, and sense of community, read on to learn more about what others around you may be experiencing, and what you can do to help. If you find that you are experiencing feelings of loneliness more often than not, you are actually not alone (see what I did there?) in this feeling. More and more people are feeling lonely (even if they have social connections) or are socially isolated (i.e. are disconnected from others and lacking social connection) in our modern society. And research shows that both are bad for your health. There is mounting evidence that loneliness can impact our hormone levels, result in increased stress and lowered immune function, which can lead to increased risk for whole host of illnesses, including coronary heart disease and stroke. I recently listened to a live webinar by Robert Kachko, ND, LAc, a naturopathic physician working to help other physicians to address social isolation in their patient population. In this webinar he explained that social isolation is as deadly as smoking 15 cigarettes a day, twice as deadly as obesity, increases the risk of cancer mortality by 25% and results in a ten times higher likelihood of suicidal thoughts and attempts at suicide. Furthermore, loneliness can increase the risk of death by 26% and social isolation can increase risk of death by 29%. Other research shows that loneliness increases risk of death by 45% and risk of developing dementia by 64%. Dean Ornish, in Love and Survival: How Good Relationships Can Bring You Health and Well-being, writes of social isolation: "I'm not aware of any other factor in medicine: not diet; not smoking; not exercise; not stress; not genetics; not drugs; not surgery that has a greater impact on our quality of life, incidence of illness, and premature deaths from all causes." Of course, it is perfectly normal to feel lonely in life sometimes. When we move to another city, first go to college or experience another socially disruptive change, it can bring on feelings of loneliness. But temporary feelings of loneliness are not the concern; it is concerning when loneliness become chronic. With increasing amounts of communication happening on electronic devices, some of our oh-so-important-face-to-face real human interaction is lost. When we are socially secure and have a solid sense of community, our immune systems are stronger, our stress levels are lower and happiness is increased. Next time you are tempted to send a text, think about calling instead, or better yet, set a time to talk in person if you live close by. Instead of spending your free time browsing social media, set time limits and use all the time you saved (and you may find that it is a lot of time!) to spend time with your friends and family. If you don't live close to your friends/family or just moved to a new place, think about joining a sports league, book club, hiking group, volunteer group or photography group, as a way to make new friends and create community while doing activities that you like. Meet-Up can be a great way to connect yourself to other like-minded individuals and spend time together doing fun things! Even small acts of social connection can make a huge impact in someone's life. The next time you are waiting for your coffee order say hi to the person beside you, wave to the neighbor you don't usually interact with, call the sibling you haven't spoken to in months or send an actual birthday card to a friend (in the mail!....not through the ether) this year. It may be a small act for you, but the impact on the other person may be larger than you can imagine. People don't often talk about feeling lonely, as it is not an easy thing to talk about. 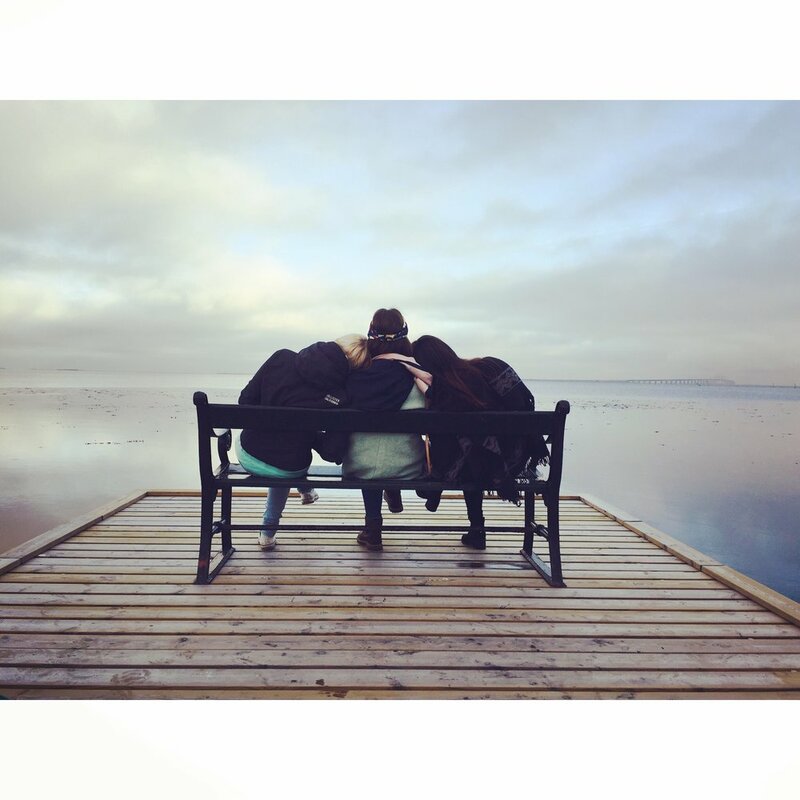 If you know or think that someone you care about is socially isolated or feeling lonely, take the initiative to connect with them. It can make a world of difference.